Those who have attended the tribute weekends at the Carousel Hotel, Blackpool, will be familiar with Colin Paul and the Persuaders. The band are enthusiastic, stylish and very committed musicians. I've never had the pleasure of seeing them perform at other venues, where they delve deeper into their rocking repertoire, but everyone who has tells me they are a band whose accomplishments make them a very popular booking.. 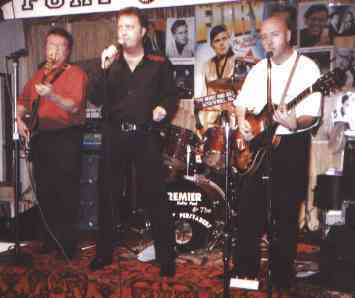 The band's tribute CD, In Thoughts Of Billy Fury, is a fine testament to their talents. There are 12 tracks, all performed with commitment and insight. Forget Him is outstanding. I hope it is not too fanciful for me to suggest that it is almost inspired. As with all of the tracks, it pays respect to Billy's recording, but then it seems that Colin reflects, and taps the source of something that provides an extra insight into the forces that shaped the song for both of them. Please judge for yourselves - it's provided here as a Real Audio track. I recommend this CD to everyone as a well-spent £10-worth. Make cheques payable to Paul Attwell and post them to 41 Catherine Road, Bredbury Green, Romiley, SK6 3DQ. Tracks are: In Thoughts Of You, Maybe Tomorrow, You Don't Know, Forget Him, A Wondrous Place, Give Me Your Word, I Will, When Will You Say I Love You, I'd Never Find Another You, Like I've Never Been Gone, Halfway To Paradise.